Why is the US Silent Regarding the DRC? When it comes to the Crisis in the Democratic Republic of the Congo the Silence is Deafening. Natural Resources are being Exploited, Various Militia Groups run rampant in the Eastern Part of the Country and the Sexual Abuse of Women is still an unresolved problem. So the Question is why has the US Been Silent in this Crisis? The Situation within the Democratic Republic of the Congo does not show any sign of being resolved. Various Militias are Active in the Eastern Part of the Country. The LRA From Uganda refused to sign a Peace Treaty with Kampala and has returned to the Bush. They have launched a new series of attacks in recent weeks. The CNDP (National Congress for the Defense of the People) Led by General Nkunda has called for the Overthrow of the Democratically Elected Government of Joseph Kabila. In recent days several Government Officals have defected to their side. The FDLR (Democratic Forces for the Liberation of Rwanda) have their own Goverment in some places. And in Ituri Province the FPJC (Front Congolaise pour la Justice au Congo.) launched its first attacks against the Government. 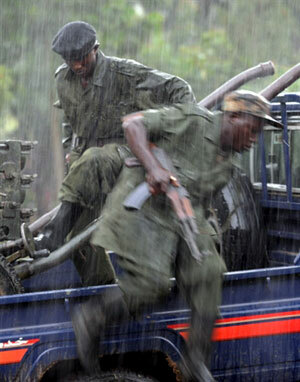 Congolese Militia are on the Move Again!! The Militias are responsible for two major areas of contention. First When Soldiers Attack Women are the Most Vulnerable of the Population. They are attacked and often used as barter. There are currently thousands of such people in the DRC. Secondly Natural Resources have been exploited. In the Past Diamonds and Timber have been traded for Weapons. Now its Minerals that are used to make Cell Phones and Video Game Systems. Where is the Outrage America? You Are Concerned with Darfur after all.